Many GST Return filers are facing error while filing GSTR-3B called ‘Checksum Validation: Failed’. This error is being faced when a user clicks on ‘Offsets Liability’ in GSTR-3B. Due to this error, the return filers are unable to file their GST Returns successfully. The Government has not provided the reason and resolution for this error. 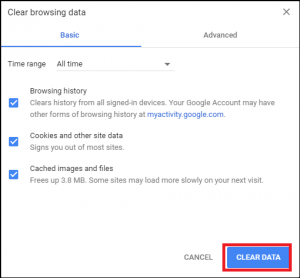 Try deleting browsing history: In your browser Go to Settings and delete browsing data. Google Chrome users can do this by pressing Ctrl + Shift + Delete. A new window will open. Click on ‘Clear Data’. Change your web browser: Login to GST Portal using Internet Explorer. Many times errors while filing a return on chrome are resolved while filing GST returns using Internet Explorer. File GST Return at night: Since the traffic on the GST Portal / GSTN is less at night try filing your GST Return after 10 p.m. If the error still persists after trying the above-mentioned solutions send a mail to GSTN with the screenshot of the error.